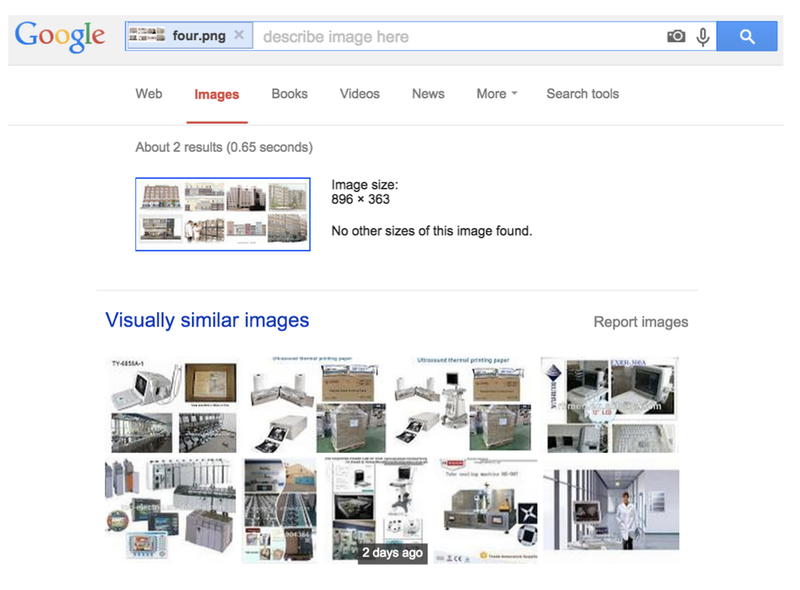 Google’s ‘search-by-image’ tool was initially designed with commercial photographers in mind. By simply uploading an image they are saved from having to scour the internet for their copyrighted pictures. Likewise, visual artists are able to discover who is using their work and in what context. A quick search of a still from Pipilotti Rist’s 1992 video work Pickelporno delivers immediate results. I’m provided with a link to each page the picture is found on — all three are located in an exhibition catalog available from the Goetz Collection’s website. Google, however, does not stop there. Perhaps, it knowingly suggests, that image isn’t quite right. Could you be looking for a turtle? A pineapple? A woman, or maybe a dog, frolicking in an autumnal scene? Isn’t it satisfying to see how the computer got it wrong? My computer never looked anyone in the eye. Its memory (2GB 1067 MHz DDR3) does not recognise the concern that hovers over the boy’s face as it abstracts him into pixels. Its operation is based in a separate set of patterns, a logic that lends itself to new perspectives. The search engine’s seemingly senseless analogy does not compute this type of meaning: the eye loses its corporal connotations to become squares of blue and green next to white, yellow and red next to black. The boy’s face becomes the eye’s roundness; the iris’s red stains merge into the boy’s pink mouth. -A meteorite traveling in range of NASA’s COBE satellite. -Bonnie and Nick’s (shared) Flickr account (Username: Nibo74). -The Spanish cartoon character Loula from the children's program Pocoyó: La Máquina de Colorear el Mundo. -The MotorMan Facebook fan-page (1283 likes). -The Chilean Ministry for Agriculture’s emergency services plane, mid-flight. -A meteorological radar of the German city of Trier (dated May 17th 2014). -The Egyptian documentary وثائقي الحرب الأهلية اللبنانية(Part 1/15, in HQ). -Copenhagen’s annual Distortion festival (2011). -Eleven YouTube accounts from nine different countries (UK, Turkey, Nepal, Italy, India, UK, Slovakia, USA, Germany, USA, Spain). The French theorist Roger Caillois was mystified by the images that appeared in the patterns of cross-sectioned stones. A slab of limestone with dendrite, if turned on its side, was a picture of a castle inhabited by a now long-extinct tribe; when held at a distance, the shape of a dinosaur’s head could be discerned in a quartz mixed with chalcedony. “So inconceivable does it seem,” he writes, “that chance alone could produce something so similar to the work of man”. Such occurrences displayed, what Caillois termed, generalised aesthetic: a project that was committed establishing the cultural within the continuity of natural phenomena. Caillois’ awestruck observations linked organic processes and human creations — searching like a detective, they are clues to a puzzle: shapes can be seen and patterns deciphered, but the only thing that can be made out with any certainty is an incessant blur. The Ancient Greek term phúsis is often translated as Nature; it is a notion that is as hard to place as psūchê: the ‘soul’ or ‘life’. While artifacts are moved with the aid of an external source, phúsis is characterised by its capacity for self-initiated motion. Although Aristotle denoted the vegetal soul as the lowest embodiment of psūchê, he also recognised it as the most salient: plant, human and non-human animal, all things that live must grow, must move. In this sense, psūchê does not dismiss phúsis but emerges from it. The computer processes an image of an eye and, like Caillois perusing a stone’s ‘chance image’, it picks up on patterns, notices resemblances: a meteorite traveling in range of NASA’s COBE satellite. When ‘eye’ is replaced with ‘pixel’ a new criteria of translation opens up and previously unthinkable associations are gained. English: ...but if you ask them they keep serious silence. In between one system and other systems meanings are made and broken down. In the theory of autopoiesis the notion of boundary is not so much a blank ‘in between’ but an interface where one autonomous system and other, external systems meet. The boundary that separates my body works to collect what is need for it to subsist. The eruption of psūchê from phusis could be described as the point when autopoietic mechanisms begun to occur in particular systems. At some uncertain time, in the ocean’s of Earth, groups of molecules reached a stage where they begun to form into reaction systems which produced the very same types of molecules that they embodied. These self-realising transformations took place in a space that the network of molecules demarcated through a self-produced boundary. Boundary, then, could be thought of as the threshold of psūchê: the autonomous, regenerating entity within, yet separate from, phúsis. From a vast and abstract series of potentialities, twenty comparisons are made. Google’s selections bring to the fore the contingency of my own perception: what appears to be the world ‘out there’ is only one field of vision. Light flips as it enters the lens of my eye. Two upside down images are relayed to the visual cortex, reversing and layering them at the back of my brain. Vision is an interaction between the eye and its surrounds, between a body and the light. Sight is one response to the light that enters into me. The Chilean biologists Humberto Maturana and Francis Verela frame this process negatively: we do not see what we do not see. In 1949, a 21-year-old Maturana was bored and bedridden with lung tuberculosis. In an isolated sanatorium he formulated a basic definition of a living system, reckoning “that all the processes that they lived, they lived with reference to themselves.” This mental wandering, born from a wholly inconvenient situation, informed the research Maturana and Verela would conduct for the rest of their careers. Autopoiesis, Maturana and Verela stress, is not concerned with an entity’s specific physicality or a type of molecular configuration, but looks to account for a system that performs a particular activity: “the accent is on the manner in which a living system becomes a distinguishable entity.”This “manner in which” is the paradoxical act of linking one system to external systems, while, in the very act of doing so, establishing itself as a closed system. A singular identity is created from a multitude of possibilities: a self-produced coherence. Out of one pattern of connection and distinction, a continuous space is enacted: an entity’s interaction with its surrounds generates meaning in continual reference to itself. “Our cognitive process (the cognitive process of the observer),” Maturana notes, “differs from the cognitive processes of other organisms only in the kinds of interactions into which we can enter ... not in the nature of the cognitive process itself." As we cannot move outside of our processes of cognition by identifying them the question changes from what is out there to what am I doing to produce this perspective. One system sees a still from the Egyptian documentary وثائقي الحرب الأهلية اللبنانية , while another recognises blue and green next to white, yellow and red next to black. In his sculptural work Essere Fiume 6, Italian artist Giuseppe Penone mapped the markings of a stone he found in a riverbed on to a stone from a neighbouring hillside. Closely observing the creases that were eroded by the flowing water of the river, Penone carved the dents into the other marble stone — making a gesture towards time, the processes of the river and the undertaking of the artist. “No matter what image an artist invents,” Caillois notes in The Writing of Stones, “... who can be sure that somewhere in the world’s vast store there is not that image’s likeness, its kin or partial parallel?” Penone constructs an uncanny scene: two identical rocks sitting unassumingly side-by-side. A sight you would never normally see walking past a riverbed or its neighboring hillside. Essere Fiume 6 is anattempt to make sense whilst recognising, in the very same movement, that verification is largely unavailable. Penone does not seek to simply acknowledge the forces of the river at work, but rather his practice is embedded in a continuum of organic processes. He brings into view a separate-yet-connected relation: a moment were human action blurs with natural cycles. “The centre of my thought,” Caillois states, “is that, because the world is finite, things in it inevitably repeat themselves, intersect, overlap. And this is what makes it possible to have poetry”. Some shapes can be seen and a pattern deciphered: from a quartz mixed with chalcedony, a dinosaur’s head emerges. Roger Caillois, The Writing of Stones, Trans. Barbara Bray, University Press of Virginia, Charlottesville, 1985. Roger Caillois, interview in Nouvel Observateur, 1974, cited in Gerard Barriere’s ‘Reconnaissance’, Novelle revue francaise, 320, 1979. Umberto Maturana and Francisco J. Verela, Autopoiesis and Cognition: The Realization of the Living, D. Reidel Publishing Company, 1980. Francisco J. Varela, ‘Autopoiesis and a Biology of Intentionality’, in Barry McMullin and Noel Murphy (Eds. ), Autopoiesis and Perception: A Workshop with Esprit Bra 3352 (Addendum), Dublin: Dublin City University, September, 1992.